SA feature in a group with hosts New Zealand, Scotland and Russia. Francois Hougaard, Juan de Jongh, Cheslin Kolbe and the rest of the Springbok Sevens squad have their attention firmly focussed on Scotland, their first opponents at the Wellington Sevens which kicks of early Saturday morning (SA time). However, the team suffered an injury blow when Ryno Benjamin was ruled out of the next two tournaments after injuring his calf during training on Thursday morning, joining a number of key players on the side-lines. Dylan Sage, the former DHL Western Province Under-21 wing who made his Springbok Sevens debut last December in Cape Town, has been called up to replace Benjamin and will arrive in the New Zealand capital late on Friday. Apart from Benjamin, stalwarts Werner Kok and Frankie Horne are long term injury casualties, while regular skipper Kyle Brown and playmaker Cecil Afrika are both nursing some niggles. This has prompted Springbok Sevens coach, Neil Powell, to include Carel du Preez and the uncapped Sandile Ngcobo. Much of the hype in the build-up to this week’s tournament in Wellington has focussed on the blockbuster clash between South Africa and tournament hosts New Zealand, which is the feature match on the opening day of the two-day event. Scotland and Russia are the two other Pool A-opponents, and the South African camp is determined not to get carried away by their success in Cape Town last December or their mouth-watering clash against the hosts. The Kiwis have bolstered their squad with the inclusion of two-time Rugby World Cup winner Sonny Bill Williams as well as several other provincial stars. However, Hougaard said he and his team mates have their full attention tuned to their opening match against the tricky Scots. “Although the excitement about our pool match against New Zealand is something nice for the fans, we will really take it one game at a time,” said Hougaard. “That means we will focus on doing our best against Scotland, and then thereafter prepare to take on Russia. “It was great to win in front of our home fans in Cape Town, but we all realise that you start every tournament from scratch. We don’t focus on individuals, but rather on what we can achieve as a team. 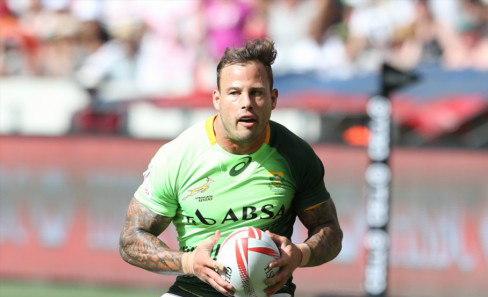 Our goals and our team culture are very important to us,” added Hougaard. On Saturday morning, South Africa will face the tournament hosts in the last match of the day at the Westpac Stadium. Kick-off time is 09h30 (SA time). Forward Philip Snyman will lead the squad in the absence of Brown, and the former Toyota Cheetahs player will make his 33rd World Series appearance in Wellington.